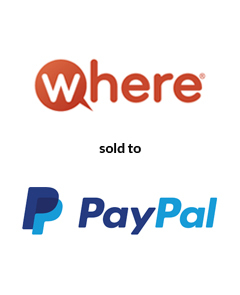 WHERE, Inc., a location-based media company and developer of mobile applications, has been acquired by eBay/PayPal, the world’s leading e-commerce company. WHERE is expected to enhance eBay/PayPal’s position in local and mobile commerce and deepen its ability to connect retailers with consumers. Terms of the agreement were not disclosed. With a team led by Jon Guido, America’s Growth Capital acted as sole financial advisor to WHERE.